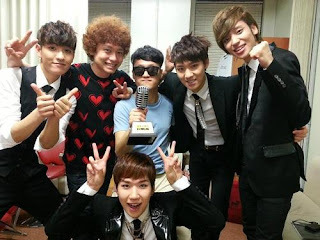 TEEN TOP and 100% win Park NamJung's episode on Immortal Song 2! Teen Top and 100% collaborated for a special performance on June 22nd Park NamJung's episode of Immortal Song 2. As representatives of their respective groups, Niel of Teen Top, Rokhyun, Hyukjin and Jonghwan of 100% gathered their energy and showcased their unique and powerful vocals and performed Park Nam Jung's "Missing You" and grabbed the victory. Immortal Song 2's official twitter uploaded a group photo and wrote, "21st century's idols with overflowing energy and abilities! Congratulations for winning the Park Namjung episode, Teen Top and 100%~! Clap clap clap!!! ".